What is a Mophead Hydrangea Flower? Mophead flowers are, literally, the Garden Variety hydrangea type. They were first selected by Japanese gardeners because they are bigger than the naturalistic lacecaps and therefore there's more of a spectacle. Spectacle, indeed. That's why we're crazy for mopheads! Both types in the same picture: mophead flower on the bottom with a lacecap up top. Like the wild lacecaps, mophead hydrangeas flower heads are also classified as corymbs. Corinne Mallet defines a corymb as "An inflorescence composed of flowers [florets] which open at the same level, but whose peduncles [individual floret stems] are not all attached to the same point of the stem." Corinne wrote Hydrangeas Species & Cultivars and I find her definition the most straightforwardly pertaining to Hydrangeas. As on lacecaps, the showy sterile florets of mopheads are made up of modified leaves that are called sepals - they are the flashy portion and they aren't even petals at all. A mophead flower contains extra showy sterile florets that occupy the center area - the area typically populated by the non-showy (demure, even) fertile florets of the lacecap types. On a mophead, the extra-abundant showy florets crowd out most of the fertile florets - to varying degrees in different varieties - thereby forming a rounded mophead rather than a flatter lacecap. Mopheads weren't set up by nature to do much of anything important. They rave on in our gardens, nurseries, and grocery store florist shops, but all those extra sterile florets limit pollen production and insect feeding. Balsam smooth hydrangea - see how there are some fertile florets nestled amongst the sterile florets in this mophead? Due to the reduced quantity of fertile florets, mophead types attract less pollinators - there simply aren't as many fertile florets to provide insect food. Mopheads on bigleaf hydrangeas (H. macrophylla) are famous for changing their flower color based on pH of the soil. In short: they're blue in acidic soils, purple in neutral, and pink in basic (alkaline) soils - yet there's a fascinating interplay with aluminum, so follow that link. Bigleaf mopheads are available with white flowers, too. Look for Blushing Bride, Mme. Emile Mouillere, Sister Theresa, and Queen of Pearls. 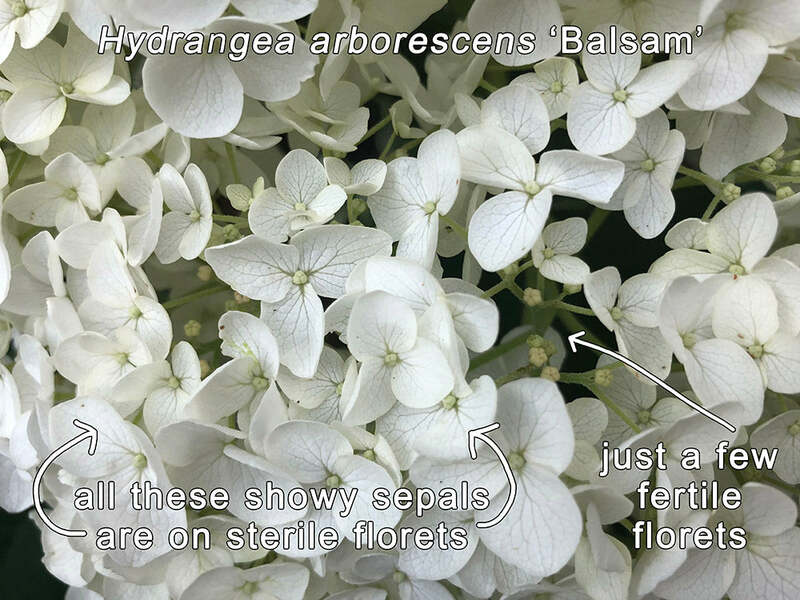 Mountain hydrangeas (H. serrata) change color as well, and so do lacecaps on both macs and serratas, but other species' flowers don't change color based on pH. Because it's a smooth hydrangea (H. arborescens), the Balsam flower pictured above will stay white and not turn pink or blue based on pH. In late summer and autumn, as bigleaf hydrangea mopheads age, they turn a different color. This is called antiquing and bigleaf hydrangea mopheads antique the best. Ruby Blossom is a pink mophead with sterile florets that have an extra row of sepals - this is called a double floret. A mophead flower is what you likely picture in your mind when you hear the word hydrangea - it's the quintessential hydrangea flower. The big blue or pink puff of this flower has become so well-known that most folks can identify a hydrangea along with a rose, if nothing else. Mopheads are the iconic hydrangea flowers of arrangements, pattern design, home decor, and, of course, gardens. The mania for bodacious mopheads started in Japan hundreds of years ago with two of the oldest selections named 'Otaksa' and 'Joseph Banks'. 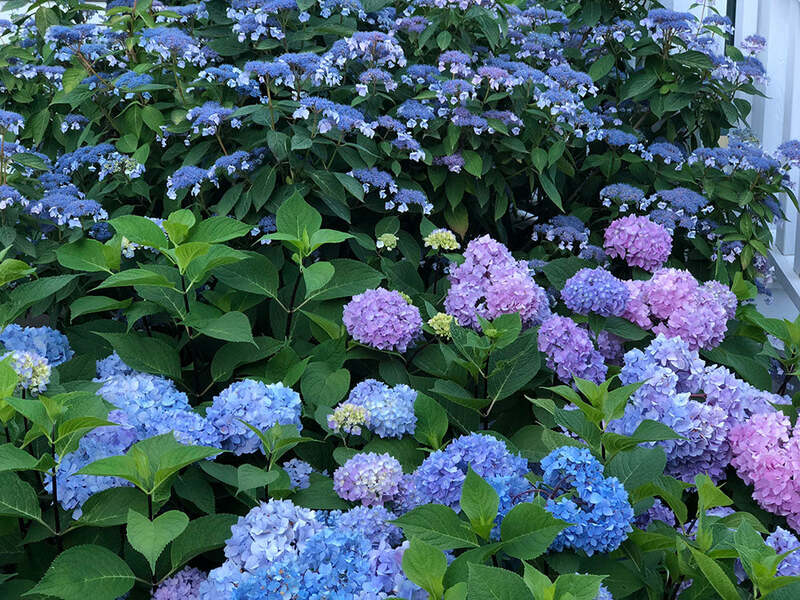 They've have been the most popular type of hydrangea flower since they were first taken out of Japanese forests and planted in the gardens of those islands. That popularity remains today and mopheads are the main focus of hydrangea breeding. Above we provided a link for you to skim details about the lacecap types, and we invite you to do the same to learn about the panicle flower types. Question? Please post below and we'll respond. Select tags to organize articles by topic. Toggle back and forth to roam our gardening information - this is an easier way than hunting and pecking through a table of contents.